I’m not quite sure what just happened in my oven, but I am pretty sure it was magical. Lest we think I am not humble— let me explain the sensation—outer super crispy skin—and fall-off the bone succulent meat. How is this even possible? High heat, apparently. Welcome to the tastier and faster way to make chicken. 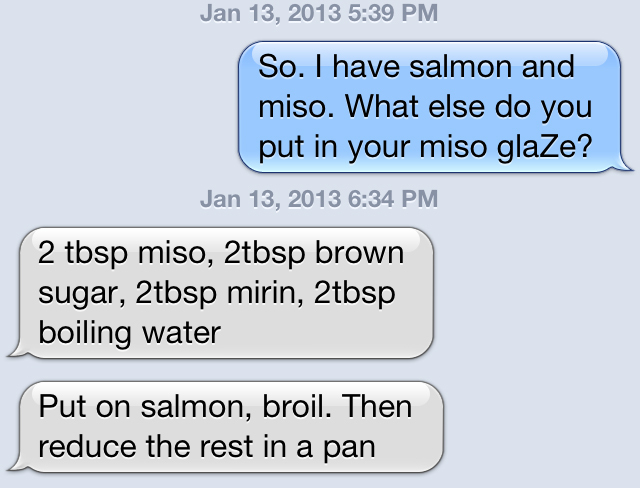 Sam pointed me to this recipe— which gives us the method. She also said- sometimes when she runs out of lemons- she puts orange in the cavity. 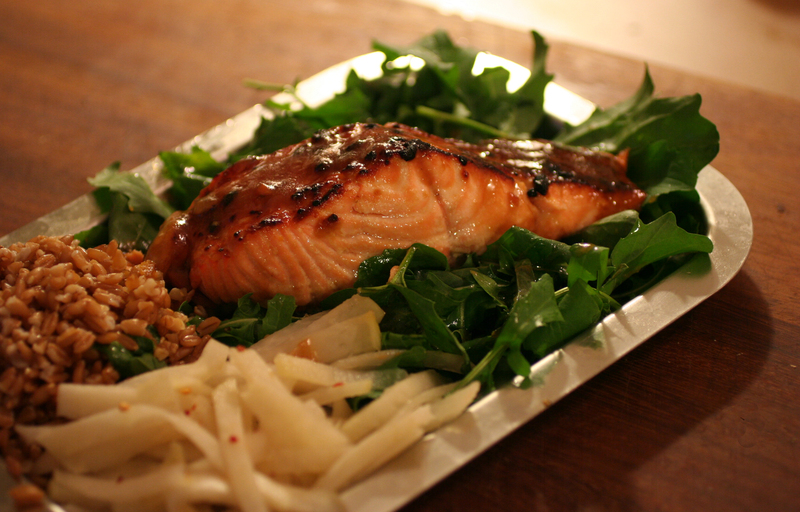 So, I took this idea- and used orange—and added that extra amazingness of Five Spice. If you don’t have/know this—it is an amazing Asian spice blend—that is warm and delicious- made from Szechwan pepper, star anise, fennel, cinnamon and cloves. You can find it most places- or you can mix up your own (which I once did in a pinch in Andorra to make some of Sydnie’s Taiwanese stew.) Other than that, I was mostly faithful to Thomas Keller’s method. One super genius move- that I think gets you’re the extra crispiness- not butter or oil on the skin. Instead, a pat of butter melting over it after you take it out of the oven- amazing! Now of course, the take-away here is the method- feel free to experiment w. spices- or keep even more faithful to the original recipe. ALSO- I did these on a bed of roast potatoes. Which amazingly- with the high heat and the chicken drippings- turned into a fry-like texture. I had small potatoes, a i chopped into big chunks, coated w. olive oil, salt & pepper. placed at bottom of the pan. 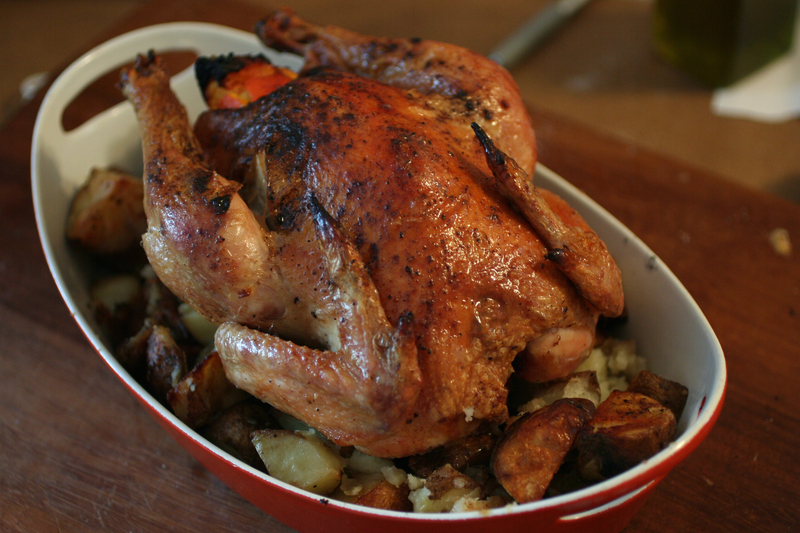 Thomas Keller’s- My Favorite Simple Roast Chicken from Epicurious. And perhaps with a sauté pan- or if you use a rack- your bottom half of the chicken would get nice and crispy too. But because I was on a bed of potatoes, this made steam. So after 30 mins, I took the chicken off, moved around the potatoes, and placed the chicken upside down for 15 mins (this gave color to the very pale underside). Then, I flipped back over- moved the potatoes one more time- for the last 15 minutes. I cooked mine for 60 minutes, because it was just larger than what the recipe calls for. Let rest. Note: The more weight the bird is- longer it takes to cook- so pay attention to the size of your bird. As a frame of reference- and not too far off- Ina Garten roasts her chicken (5-6 pounds) at 425 for 1 ½ hours, or until the juices run clear when you cut between the leg and the thigh. I don’t want to confuse things. I just want to tell you people are always way more nervous—about not cooking the chicken enough- when you really could be worried about not over-cooking it.